The crucifixion. Excruciating, painful, humiliating. It was the worst form of execution ever invented. The Romans didn't invent it, the Persians did, but the Romans honed it for the execution of the worst of their society's criminals. If you are a Christian, you've no doubt been sitting under a pastor at some time, or heard one online, describing in detail the elements of what the Romans/Jews/Us did to the Lord on the cross, and even before. Scourging and beatings were part of the execution, so as to make the time on the cross even more excruciating. As a matter of fact, the word excruciating comes from crucifixion. The Latin word excrucio means From ex- ("out of, from") +‎ cruciō ("crucify; torture, torment"). I saw this tent peg and snapped a photo of it. I know that we say "He was nailed to the cross" and He was. But don't think of little picture hangers or small nails in handyman projects. The nails to nail Jesus to the cross were huge, thick, iron things more like spikes According to one website, they were likely 7-9 inches in length. If you'd like to read more about the actual crucifixion, this link takes you to a short and good essay. I'd re-post it here but the authors ask not t re-post their material online as it confuses the search engines. I've only read one article on the site, but the article in my opinion is good. On this Lord's Day, it's good to ponder the actual crucifixion, what He did for us. 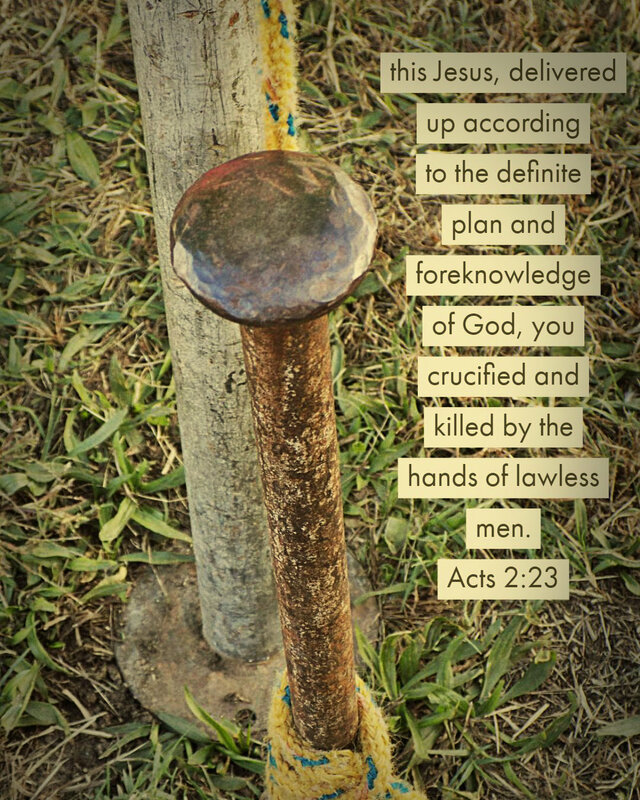 It was our sin that kept Him nailed him to the cross. As I'd read long ago, the only man-made thing in heaven will be the scars on Jesus' hands and side.